Come out and test your athletic abilities over 3.5 miles of mud & obstacles. Saturday, September, 14, 2013 at 8:00am at the Ben Clark Training Center in Riverside, CA. Free parking, bag check in and free Kid''s Mud Run. 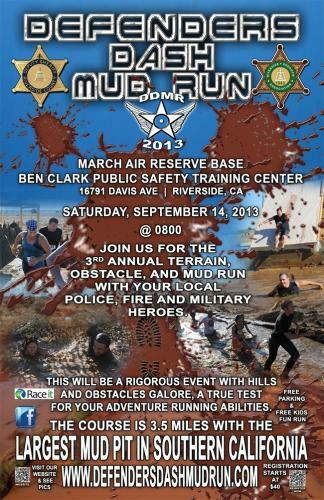 The Defenders Dash Mud Run is sponsored by the Riverside Sheriff''s Association and Riverside County Sheriff''s Department and benefits the Arthritis Foundation Inland Empire, Special Olympics- Southern California and Dominic Durden Memorial Scholarship via Riverside Community College District. Fees: $50 until 9/12; $60 9/13 & event day. All teams of 10 or more will receive a $5 discount per person.